The Battle of Carnifex Ferry took place on September 10, 1861, in Nicholas County, Virginia (now West Virginia), as part of the Operations in Western Virginia Campaign during the American Civil War. The battle resulted in a Union victory that contributed to the eventual Confederate withdrawal from western Virginia. The campaign helped pave the way for the subsequent creation of the separate state of West Virginia. In early September 1861, Confederate forces under Brig. Gen. John B. Floyd crossed the Gauley River and surprised the 7th Ohio Infantry under Col. Erastus Tyler at Kessler’s Cross Lanes. Outnumbered, Tyler's inexperienced men routed, and Floyd camped near Carnifex Ferry. The Confederates began throwing up entrenchments on the Henry Patterson farm (located on the rim of the Gauley River Canyon near Summersville). Concerned about Floyd's drive to reclaim the Kanawha Valley, Union Brig. Gen. William S. Rosecrans led three brigades of infantry southward from Clarksburg to support Tyler's regrouped regiment. Moving into position on the afternoon of September 10, Rosecrans advanced against Floyd's campsite and attacked. Fighting raged for several hours until darkness finally halted the bloodshed. The strength of Rosecrans's artillery proved to be problematic, and Floyd decided to retreat that night across the ferry to the south side of the Gauley River. He subsequently moved eastward to Meadow Bluff near Lewisburg. Floyd, seeking to deflect the blame, placed the responsibility for the defeat on his co-commander Brig. Gen. Henry A. Wise, furthering the dissension that marked the Confederate high command in western Virginia. Carnifex Ferry Battlefield State Park is an American Civil War battle site that commemorates the Battle of Carnifex Ferry. 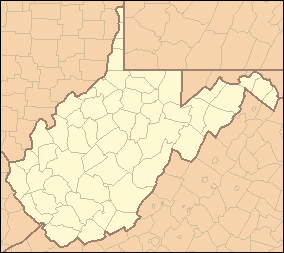 It is located on the rim of the Gauley River Canyon near Summersville, a town in Nicholas County, West Virginia. The 156-acre (0.63 km2) park features Patterson House Museum, three views of the Gauley River, hiking trails and picnic facilities. It is one of the oldest state parks in the United States. A Civil War reenactment takes place on a weekend after Labor Day. As Carnifex Ferry State Park, it was listed on the National Register of Historic Places in 1974. Description: Learning of Col. Erastus Tyler’s rout at Kessler’s Cross Lanes, Brig. Gen. William S. Rosecrans moved three brigades south from Clarksburg to support him. On the afternoon of September 10, he advanced against Brig. Gen. John Floyd’s camps at Carnifex Ferry. Darkness halted several hours’ fighting. The strength of the Union artillery convinced Floyd to retreat during the night. Floyd blamed his defeat on his co-commander Brig. Gen. Henry Wise, contributing to further dissension in the Confederate ranks.